April 25, 2018	The Contemporary Ensemble will perform at 7:10 pm. In addition to performing selections from his album, Emmet will sing Broadway standards (“Bring Him Home,” “Music Of The Night”), nostalgic favorites (“Moon River,” “Beauty and the Beast”) and well-loved hymns (“How Great Thou Art,” “Be Thou My Vision”), plus an occasional operatic aria that will showcase his classical vocal training received at the Royal Irish Academy of Music in Dublin. 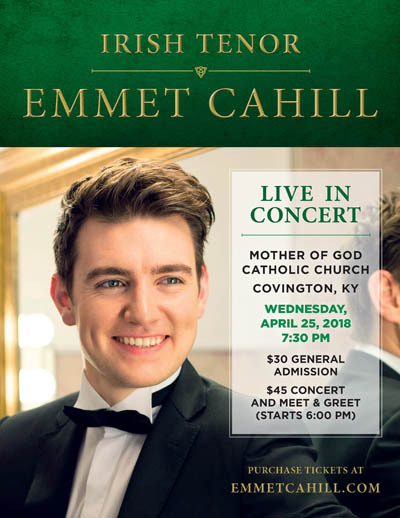 General admission tickets are $30 and may be purchased online at http://www.emmetcahill.com/tour-dates/ or at the church. A limited number of Meet & Greet tickets, which include a pre-concert meeting with Emmet plus the concert, are available for $45. It’ll be a special night of songs and tales with the Emerald Isle’s most exciting young tenor! For more information, contact Cindy Duesing at 859-512-1063 or cduesing@twc.com.